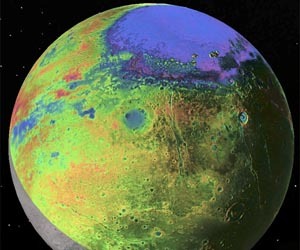 Ascension with Mother Earth and Current State of Affairs: Could There Be Life in Pluto's Ocean? William McKinnon, professor of Earth and planetary sciences in Arts and Sciences at Washington University in St. Louis and a co-author on two of four new Pluto studies published Dec. 1 in Nature, argues that beneath the heart-shaped region on Pluto known as Sputnik Planitia there lies an ocean laden with ammonia. The presence of the pungent, colorless liquid helps to explain not only Pluto's orientation in space but also the persistence of the massive, ice-capped ocean that other researchers call "slushy" - but McKinnon prefers to depict as syrupy. "In fact, New Horizons has detected ammonia as a compound on Pluto's big moon, Charon, and on one of Pluto's small moons. So it's almost certainly inside Pluto," McKinnon said. "What I think is down there in the ocean is rather noxious, very cold, salty and very ammonia-rich - almost a syrup.